Contradictory accounts are emerging in the wake of the apparent failure of the Zuma mission—a secretive multibillion-dollar spy satellite that was launched by SpaceX from Cape Canaveral, Florida this past weekend. Everything seemed fine on Sunday as the spy satellite was launched aboard a Falcon 9 rocket. SpaceX founder Elon Musk even tweeted about it, dropping a super-sweet photo of the launch. The private rocket company typically broadcasts an entire satellite deployment via its livestream, but not for classified missions such as this one. Subsequently, no one got to see the separation of the nose cone, or watch the satellite embedded within being deployed into orbit. 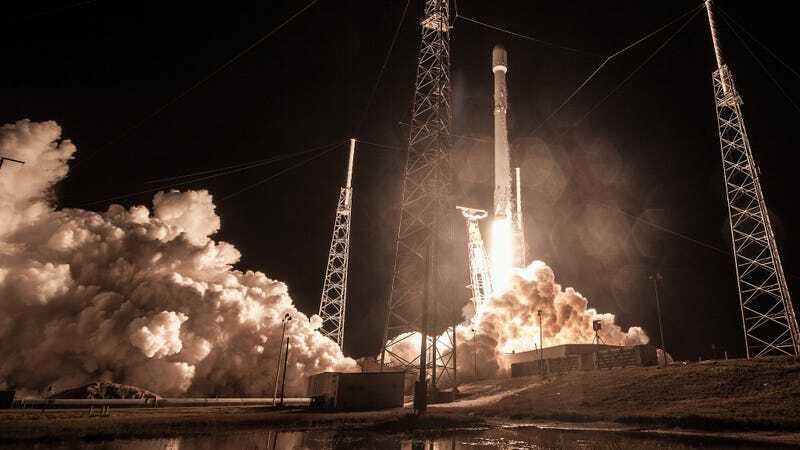 But concerns soon emerged that something had gone wrong when neither SpaceX or Northrop Grumman—the manufacturer of the spy satellite—confirmed a successful deployment. The Wall Street Journal was the first publication to report that something bad had happened, claiming that the spacecraft did not separate from the rocket. Then Bloomberg, after speaking to U.S. officials who were briefed on the mission and who spoke on conditions of anonymity, said the second-stage booster of the Falcon 9 had failed, and that the satellite either broke up or fell into the sea. This morning, Reuters reported that an investigation has been launched, but said that there’s no reason to believe “sabotage or other interference” was involved in the apparent failure. The satellite is presumed to be a “total loss,” according to unnamed U.S. officials interviewed by Bloomberg. SpaceX, on the other hand, had something very different to say. So if this comment by SpaceX is true, that means its Falcon 9 did what it was supposed to do: that is, launch the rocket, perform the two-stage separation, and deploy the Zuma satellite into its intended orbit. And indeed, as Shotwell made clear, the incident has not prompted any launch delays or a review of the company’s launch systems. It’s important to point out that the Falcon 9's reusable first-stage successfully landed in Florida, so we know SpaceX got that part right. Northrop Grumman is refusing to provide any information, telling publications that it’s not able to comment on classified missions. The comments from SpaceX are thus in contradiction with what’s being reported elsewhere. SpaceX says it did what it was supposed to do—deliver a satellite into its intended orbit. Meanwhile, the WSJ and Bloomberg are saying the satellite fell back to Earth or disintegrated because it failed to separate from the upper part of the rocket. Strangely—and in yet another apparent contradiction—U.S. Strategic Command told Bloomberg that its not tracking any new satellites. This is a classified mission, so we’re obviously working with limited information. There are a number of scenarios, however, that could explain what happened, while affirming SpaceX’s claim that it wasn’t responsible for the failure. For example, Northrop Grumman provided its own payload adapter for the Zuma mission—a device that physically separates the satellite from the upper part of the rocket during deployment. Normally SpaceX provides this adapter, so if this is the part that failed, the SpaceX statement is technically correct. Other possibilities include the satellite not powering up at separation (which means it’s still in orbit, but dead) or that Zuma accidentally oriented itself in an orbit that sent it plummeting towards Earth. Or, the Bloomberg and WSJ accounts are correct, and there was some kind of failure during the second stage. Needless to say, all this confusion, not to mention the secretive nature of the mission, is bound to lead to conspiratorial theories—that that satellite was in fact delivered successfully, and that this is all a rouse to hide the fact that a very expensive spy satellite is now in orbit. Highly unlikely, to be sure—but it’d sure be nice to know what the hell actually happened.